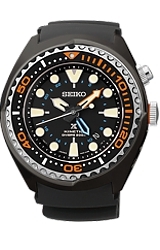 The PROSPEX GMT DIVER has Seiko's finest technology in its toughest designed watchcase. In fact the watch case design incorporates two cases, one inside the other! 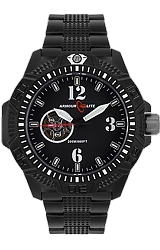 It's as tough a dive watch as you can find. 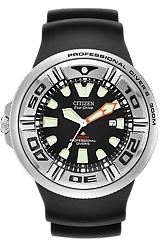 Plus the GMT DIver uses Kinetic technology, so you never replace a battery, your body's movement powers the watch. 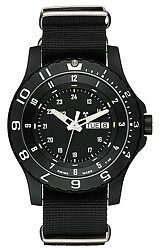 The model SUN023 has a black ion plated steel case with a black silicon strap. This is a large watch, 47.5 millimeters in diameter.